Come visit us on beautiful Captiva Island and stay in our 'Life's a Beach' cottage. Our property is a lovely ground level cottage nestled in beautiful lush and tropical gardens. 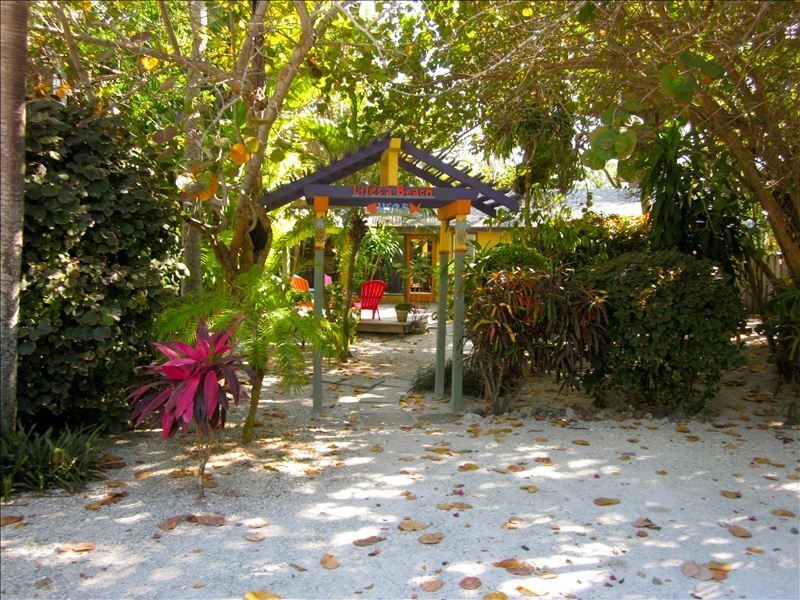 Located on wonderful Wightman lane a small private beach road in the heart of Captiva Island. Considered one of the best locations on Captiva. From here walk to private beach and village in just 5 minutes. Relax in your private large hot tub, enjoy outdoor dinning and lounging areas in front and back of your vacation home. Relaxation island style is guaranteed. For dinner and sunset drinks walk to Captiva's beautiful and famous shelling beaches and historic village. Enjoy nightly beach front sunsets and award winning dining and shop the many unique stores and galleries. Enjoy the warm gulf waters, restaurants, shops, galleries. Huge variety of activities are available on the island. Fishing, boating, boat charter, outer island tours, sunset cruises, dolphin and wildlife cruises. Bird watching, canoe and kayak thru the back bay and mangroves, bike, golf, parasail, skate, shelling, Jet ski, marina. Area: Our 'Life' a Beach' is just steps to the beach, restaurants and galleries. 10 minute drive to Sanibel Island village were you find an additional variety of restaurants, shops, galleries, gourmet groceries, waterfront restaurants and entertainment. Famous Ding Darling preserve, Tarpon Bay recreation area, shell museum, Sanibel Captiva Conservation Foundation and many nature trails and tours are available. Over 50 miles of safe bike lanes on Sanibel. Bike rental. We fell in love with Captiva after a short visit to the gulf coast in 1996. We had just build a vacation home in Breckenridge, Colorado but after finding Captiva we decided that we love the warm weather and the beautiful beach more than the cold. We quickly sold the mountain home and purchased our lovely beach cottage located in the heart of the island. We have never regretted buying the cottage and love to spend as much time as possible in Captiva. This island is a wonderful place and the beaches and sunsets are magnificent. We are sure you will fall in love with Captiva and Life's a Beach too. Captiva is the most beautiful tropical island in the US. The one thing all our quests comment on is that they feel like they have left reality and stress behind and truly felt like living in paradise for a while. Leave all your worries on the mainland and enjoy our beautiful island and our relaxing cottage. Walk to wonderful Captiva beach with private beach access and historic Captiva village in 5 minutes. Walk to beach and historic Captiva village in 5 minutes. Large Hot Tub for 6 adults, private to the cottage,covered. Captiva island is a true gem on the gulf coast. Our beach cottage is right in the heart of the island on wonderful Wightman lane. Easy walk to beach and all restaurants.close to historic Jansens marina for boat rentals or to hire a water taxi to take you to the neighboring islands for lunch. Sanibel island offers an array of restaurants and bars as well as miles of bike lanes and famous Ding Darling natural preserve just 10 minutes away from the cottage. Also visit the wonderful Shell Museum.Sanibel brand new Rec Center 10 minutes away.